PARTNERS ARE ASSESSING NEEDS AND PROVIDING SUPPLIES TO DEVASTATED COMMUNITIES IN FREETOWN.  Samaritan’s Purse is bringing physical relief and spiritual comfort to struggling communities in Sierra Leone’s capital, Freetown, where recent downpours claimed over 1,000 lives. Heavy rains triggered mudslides that ravaged the city last week, with many homes destroyed and hundreds of people still missing. “I got out of bed and went outside. I knew something was happening so I started shouting ‘Let everyone come out! Something is to happen!’” said community leader Abu Bakah Kamara who said the approaching waters shook the ground. THE EARTH BEHIND SURVIVOR DANIEL MOIJUEH SHOWS THE AFTERMATH OF DEVASTATING FLOODING THAT CLAIMED SEVEN FAMILY MEMBERS. Residents fear more flooding will come as the rainy season continues to drench this West African coastal city. We are working through the Evangelical Fellowship of Sierra Leone and partnering churches to provide emergency supplies in Jesus’ Name to devastated survivors who lost homes, livelihoods, and loved ones in the deluge. With water cut off in some areas, cholera is a threat, so we will bring full hygiene kits for hundreds of beneficiaries. Dozens of families will also receive cooking kits, food rations, and plastic buckets. 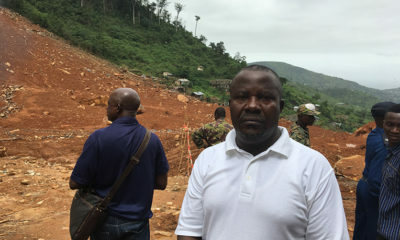 John Mansaray, pastor of Bethel Ministries Church in Freetown, said they have opened their church building as a makeshift shelter for dozens of families. 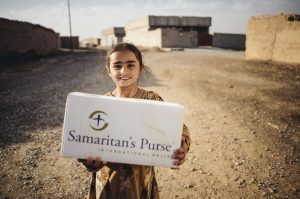 As they go out, Samaritan’s Purse teams are meeting people like Daniel Moijueh, a father and husband who returned home to find his family missing or dead. He lost seven family members last week. Pray that the Good News of Jesus Christ would comfort and transform so many residents grieving the loss of family, friends, spouses, and children. Please pray as our teams continue assessing and meeting critical needs.